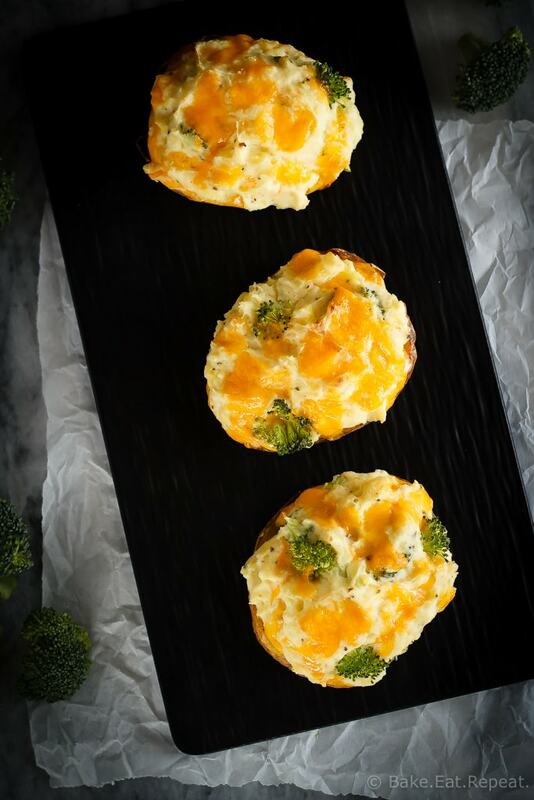 These twice baked potatoes filled with cheddar cheese and broccoli are the perfect side dish – they’re easy to make and the whole family will love them! 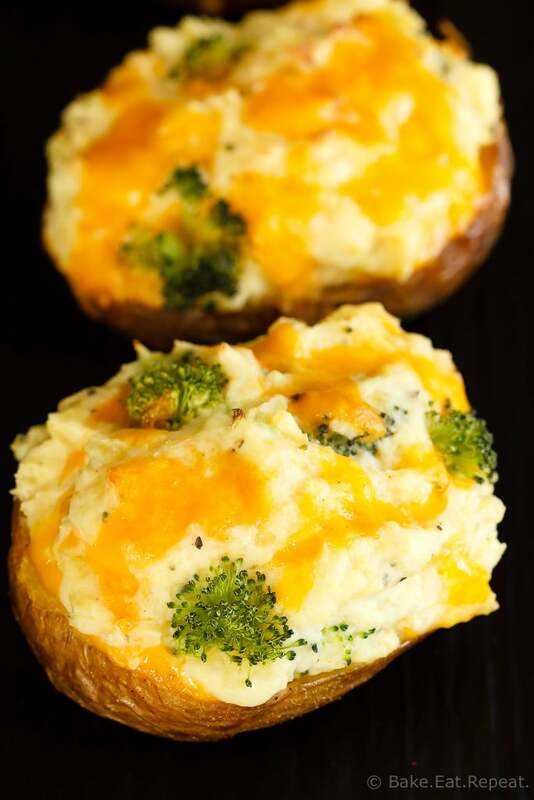 Who loves twice baked potatoes? I really do – which is saying something since potatoes aren’t my favourite side dish. When it comes to adding a carb to my meal, I typically choose some kind of bread. Or pasta. Maybe even rice. Potatoes are usually the last on the list. I know, you’re thinking I’m a bit crazy. Most people love potatoes. I’ll eat them, but they’re not my favourite. Except when you fill them with cheese and broccoli and bake them a second time. Then they’re fantastic. 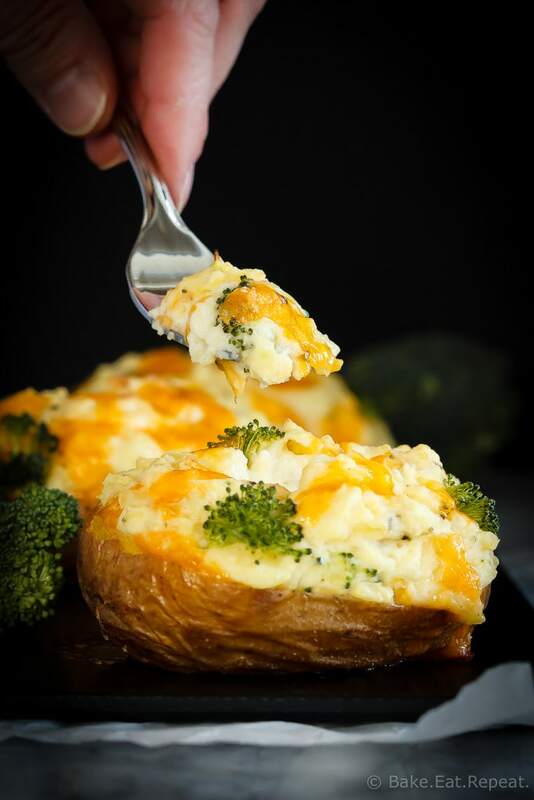 These twice baked potatoes with cheddar and broccoli are absolutely amazing. It’s a recipe my mom has been making for years and I finally got it from her because we always enjoy them when she makes them! They’re not quite as quick and easy to throw together as these roasted rosemary potatoes are, but they’re really not difficult. It just takes a little time to scoop out the potato flesh, mix it with the other ingredients, and pile it back into the potato skins. Not enough time to prevent me from making them on a semi-regular basis though, because twice baked potatoes are such a great side dish. I also love that these stuffed potatoes can be lightened up a bit with low fat sour cream and cream cheese – and they still taste fantastic. I’ve never even noticed a difference when using the low fat ingredients – they are still just as creamy and amazing as with the full fat kinds. So you can use your preference and know that you will still have some amazing twice baked potatoes to enjoy! 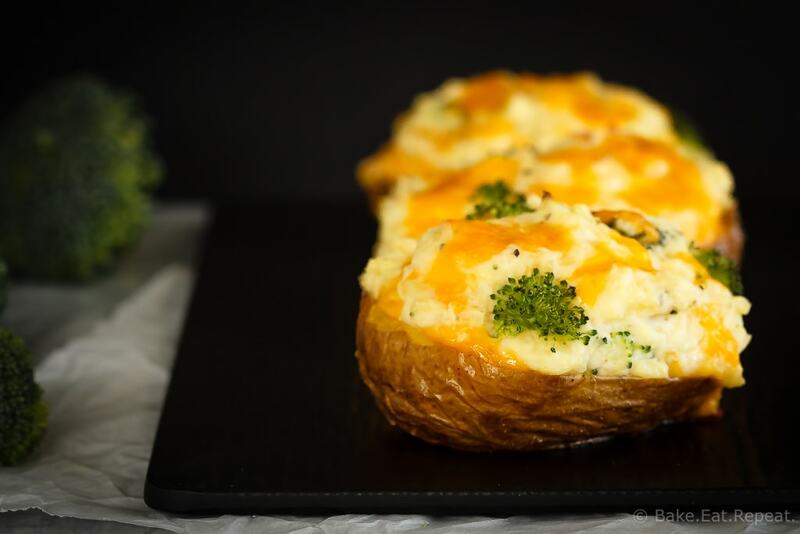 These twice baked potatoes filled with cheddar cheese and broccoli are the perfect side dish - they're easy to make and the whole family will love them! Preheat the oven to 400 degrees F. Wash and dry the potatoes, then rub them with the olive oil and sprinkle with salt and pepper. Place them on a foil lined baking sheet and bake for 55-60 minutes, or until they are tender when pierced with a fork. The time will vary a bit depending on the size of your potatoes. Remove from the oven and let them cool for a bit until they are easy to handle. Reduce the oven heat to 375 degrees F.
Slice them in half, lengthwise, and scoop out the potato flesh, leaving about 1/8” of potato along the skins. In a large bowl, use a potato masher to mash the potato flesh with the sour cream, milk, cream cheese, dijon mustard, salt and pepper until it is well combined. Stir in 1 cup of cheddar cheese and the broccoli florets. Spoon the potato mixture back into the potato skins, dividing it between them. Sprinkle the remaining 1/4 cup of cheddar cheese on top. Bake the filled potato skin halves at 375 degrees F for 25-30 minutes. Serve immediately. I have used both full fat and low fat sour cream and cream cheese for this recipe and both work well. I think 1% milk would be fine too, but haven’t tried it.